Your laptop can easily be infected with viruses. Once you buy a new laptop, you have to manually copy all of your photos to the new one. You can easily lose your phone or laptop. There is no such thing as unlimited storage. The last reason is probably the biggest reason why most people prefer using photo sharing websites. Not all of the photo sharing websites give you unlimited storage but most of them give you more than enough. If it isn’t enough for you, just open a new email account and continue uploading, right? If you have internet access, you can backup and restore all of your photos. You don’t need to worry about viruses or hacking because these photo storage websites have maximum security and regularly backup your photos – they are protecting your photos better than you do. Even if their service is free, you can increase the storage limit by paying and that’s why you are valuable for them, you are a potential customer. Free storage and freeing up some space sounds great however, some bloggers use photo sharing websites as image hosting websites for speeding up their own websites. The idea is simple; in order to add an image to any website, you just need its link and instead of uploading the image to your own server, you are uploading it other websites and get the link of the image. These websites are amazing since their databases are optimized to store images better and faster than any other storage websites. Most bloggers use WordPress and if you are a beginner I am assuming you don’t want to pay higher fees for dedicated server so you are using a shared hosting. Shared hosting means they are keeping your website along with other websites in a single server computer. The drawback of the shared hosting is, as you can guess, slow loading websites. Especially if photo quality is very important for your website, uploading high-quality images to your server makes your website extremely slow. Even if you are willing to pay higher fees for dedicated server hosting, your servers are not going to be optimized as an image hosting website. YouTube videos are loading faster than any other player on the internet because they know exactly how to store a video. The same logic applies to the image hosting websites, even dedicated server hosting can’t reach their loading speed. Can Google Photos Be Used For Image Hosting? Google Photos is the only image storage website that gives you unlimited storage space if you are willing to keep them under 16 megapixels. Visual content is important for all websites but not all of us need to present high-quality images so 16 megapixels is good enough. However, Google Photos doesn’t give us the link to the images so it can’t be used as image hosting website. Flickr doesn’t give you unlimited storage space but 1TB is a lot more than you can need. If you ever, somehow, exceed the limit, you can open a new account and get 1TB additional space. It is easy to upload, easy to use and more importantly Flickr provides the link of the image so we can use Flickr as image hosting website. Maximum file size for each photo is 200MB, which is hard to exceed even with a pro camera. In order to use Flickr for image hosting, you need to get the image link and to do that, here are the steps you should follow. 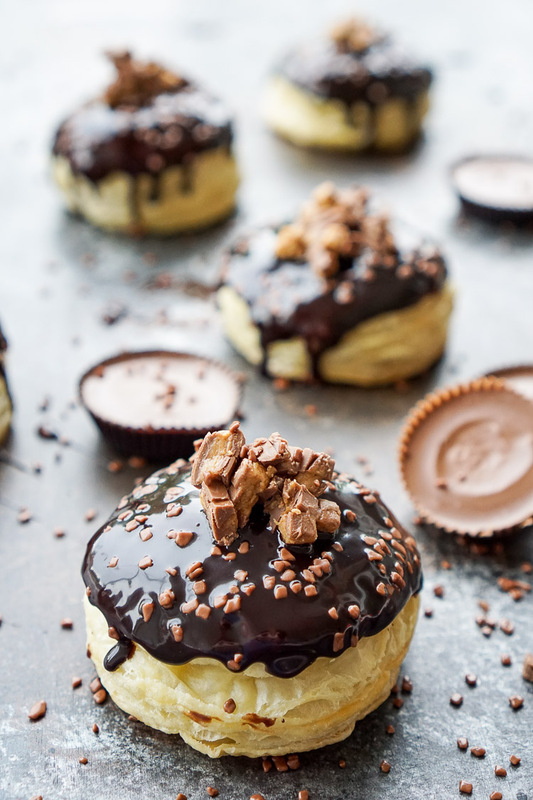 After you upload the image to Flickr, select the image and then click “share” button. Click “Embed” and be sure to select “Original”. 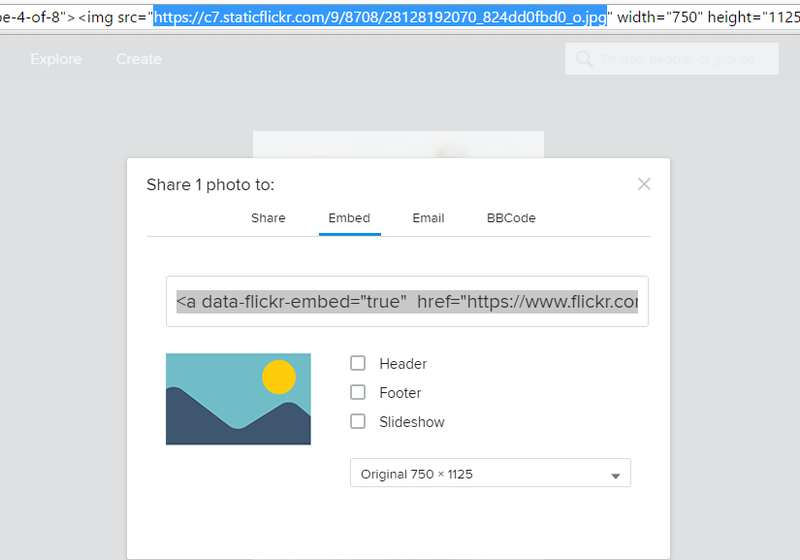 Copy the link that starts with “<a data-flickr-embed…” and paste it into your address bar. You can also paste the link somewhere else but it is easier to for me to use address bar. We don’t need the whole link, we just need the image link. Therefore, find the part that starts with “img src=” and copy the link inside of the quotation mark. Image links usually end with “.jpg” or “.png” so you know it is the link of the image. Now, in order to put images inside the HTML, you need to use certain tags and follow certain rules. Let me show you the easiest way. Photobucket is another image hosting website but it only provides 2GB free storage which extremely less than its competitors. Its images load quite fast but I am not sure if it is faster than Flickr but I don’t recommend using Photobucket, not just yet. I don’t want to call them amateurs but Photobucket have still a long way to go. When you upload the images to these websites instead of your own, you expect them to be displayed. But if the image hosting website you are using experience problems, the images in your website will not display. You can’t see that kind of problem with Flickr or Google Photos because they probably have dozens of backup servers. If there is any problem with their server, which is quite unlikely, they immediately use backup servers and you don’t even understand or even sense these problems. Photobucket is still far from being on the same level with Flickr and Google. 2 days ago Photobucket was down and it has lasted for about 36 hours. 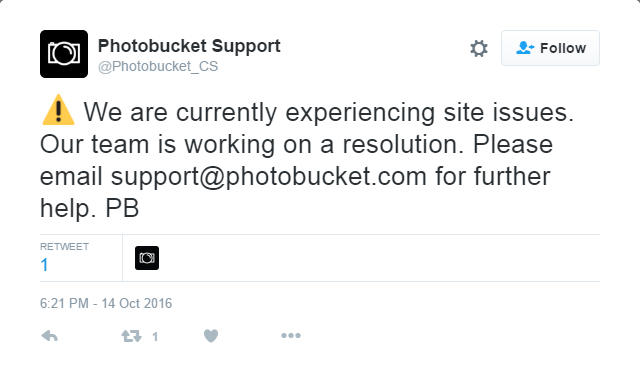 That means if you were a Photobucket customer, all of the images on your website were disappeared for more than a whole day! 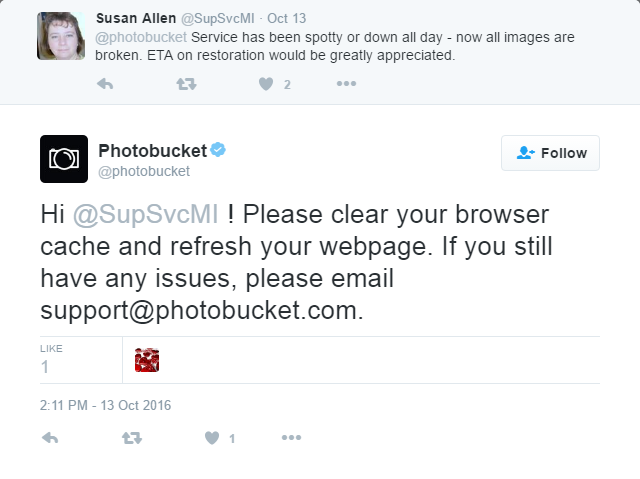 At the beginning of the problem, most people think it was a maintenance but Photobucket was not even aware of the problem. They kept telling people to clear their browser cache. After 28 hours of missing photos, they finally realized there was a problem with the website. Without any doubt, the winner is Flickr. Even if Google Photos provides unlimited storage, the quality of the image is important for all of us and I don’t think anyone would agree with the idea of missing pixels from our photos. With its 1TB storage limit and 200MB file size limit per each photo, Flickr is far ahead of the competition. Tinypic – The image size limit is 1600 pixels, either width or height. Imgur – The images cannot be displayed in some countries like Turkey. The maximum file size for images is 20MB. ImageShack – The maximum file size for images is 5MB. Previous PostShould You Disable Text Selection From Your Website?